Ray Wills - Understanding climate change. An enormous amount of scientific research has established that during the Earth's 4.5 billion-year history, the climate has varied and changed on a wide range of time scales, due to natural causes and without human activities impacting. While the Earth's climate is dynamic and climate change is normal and continuous, another enourmous body of research, has empirically and theoretically well-established the enhanced greenhouse effect. Human impact is now overwhelming variation in the natural system. The data I use is from a range of science publications like Science and Nature as well as more specialist science journals and websites – all publically available data. Some produce continuous data streams like the NASA and WMO cluster of research groups – dedicated science websites like NASA (http://earthobservatory.nasa.gov/), NOAA (http://www.noaa.gov/), and the WMO (http://www.wmo.ch/). Australia's Climate Commission summary - The Critical Decade: Climate Science Risks and Responses - and the risks have never been clearer and the case for action has never been more urgent. 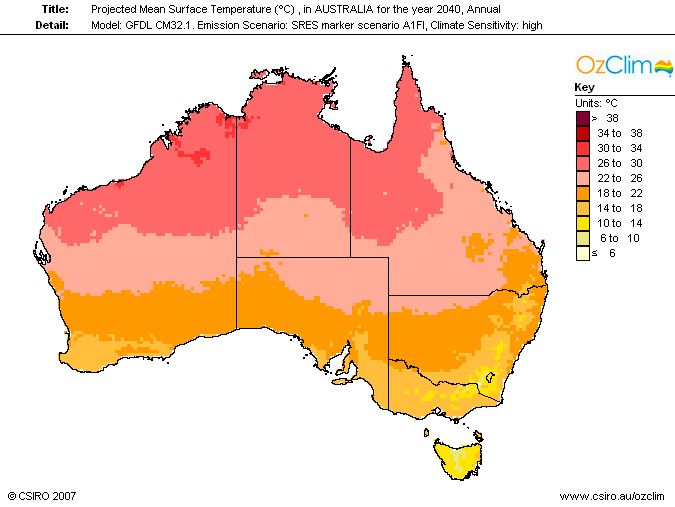 Garnaut Climate Change Review-Update 2011. In November 2010, Ross Garnaut was commissioned by the Australian Government to provide an independent update to his 2008 Climate Change Review. 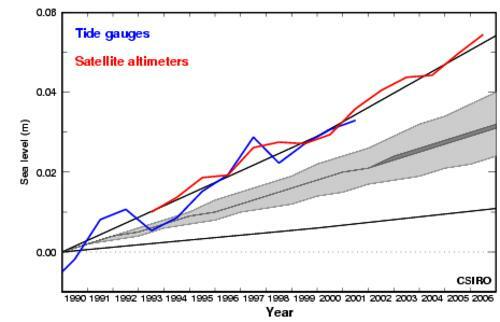 Temperatures are still rising: http://data.giss.nasa.gov/gistemp/ in atmosphere from humans important - as reflected in statements from every major Academy of Science including theexamples above. CO2 is a greenhouse gas and is important - climate skeptics often say "Carbon dioxide is a colourless, odourless, non-toxic gas"
This is a nonsense unscientific argument in relation to its role as a greenhouse gas – the basic physics that the ‘colourless’ part is only relevant to the human eye – it does not describe the response to the infrared spectrum which is where its properties contribute to CO2 being a potent greenhouse gas. When CO2 was much higher in geological history, average global temperature on the planet was up to 5 deg C higher than today. CO2 levels have varied over the earth's history but the overall trend line is down as biological systems have continuously trapped CO2 and this has led to biological sequestration in fossil fuel reserves and other carbon deposits together with continuous geological sequestration through the formation of limestone and similar. CO2 levels have been the lowest in earth's history for about the last 40 million years or so (based on geological evidence). In that time frame, evolution in that period has delivered most of the plants and animals we are now familiar with – eucalypts, banksia, most mammals from whales and dolphins, to dogs and humans – most in the last 25 million years. The geological context of the dinosaurs is not a time scale relevant to the point of time in which we live – the climate change of today is relevant to us today. A warmer dinosaur level temperature climate will support life – just not as much as 95% of the species alive on the planet today. Has the world stopped warming? 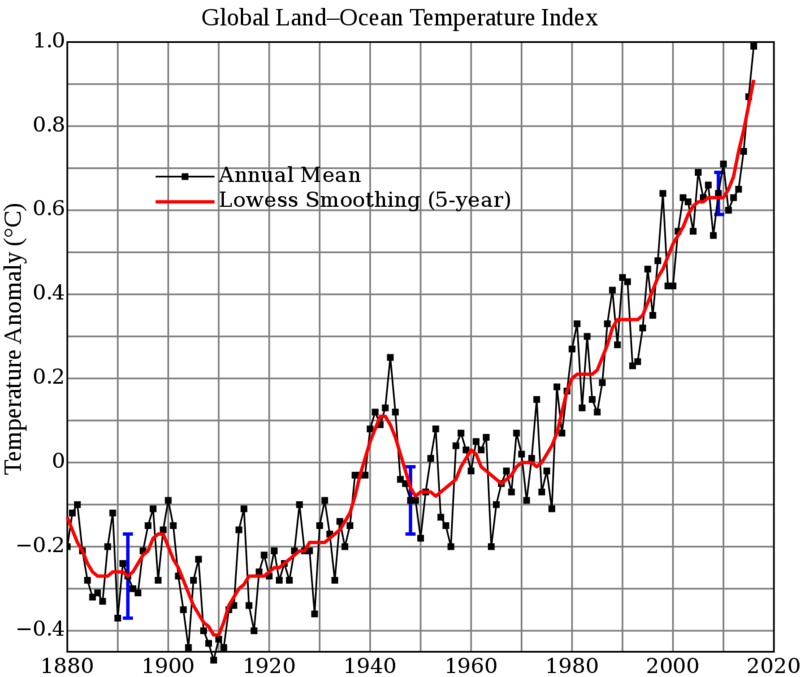 You can see the average global temperature measured since 1880 - temperature has risen since the mid-1970s with occassional pauses as is best illustrated by the moving 5 year average. 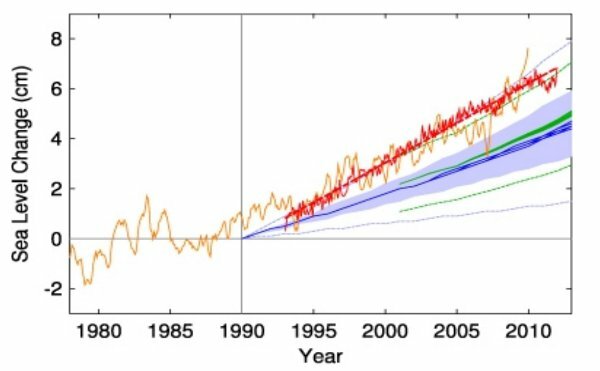 Statistically there has been no reduction in global temperatures, and based on the data, warming is following the trends of the last 40 years. 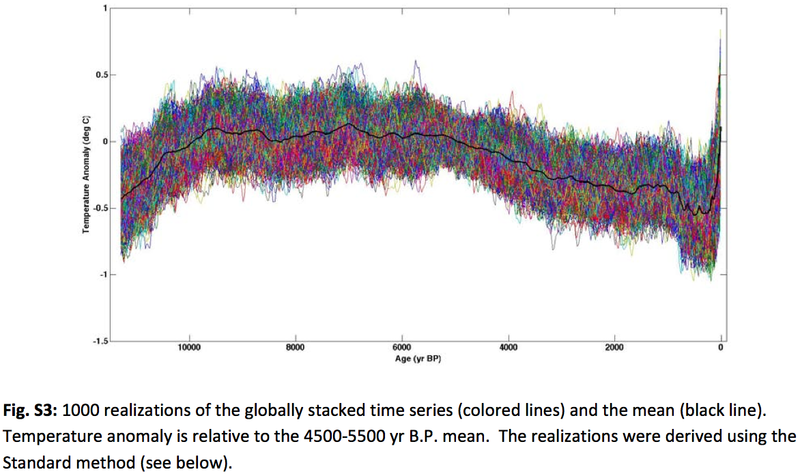 The data also illustrates an important point - temperature rise is not linear, but the trend is consistent. Nor has the earth cooled in the last decade - but has taken a pause in warming consistent with the pattern of warming in the last 50 years. The following graph and text is from the Skeptical Science website. One of the most common misunderstandings amongst climate change "skeptics" is the difference between short-term noise and long-term signal. This animation shows how the same temperature data (green) that is used to determine the long-term global surface air warming trend of 0.16°C per decade (red) can be used inappropriately to "cherrypick" short time periods that show a cooling trend simply because the endpoints are carefully chosen and the trend is dominated by short-term noise in the data (blue steps). Isn't it strange how five periods of cooling can add up to a clear warming trend over the last 4 decades? Several factors can have a large impact on short-term temperatures, such as oceanic cycles like the El Niño Southern Oscillation (ENSO) or the 11-year solar cycle. These short-term cycles don't have long-term effects on the Earth's temperature, unlike the continuing upward trend caused by global warming from human greenhouse gas emissions. The data (green) are the average of the NASA GISS, NOAA NCDC, and HadCRUT4 monthly global surface temperature anomaly datasets from January 1970 through November 2012, with linear trends for the short time periods Jan 1970 to Oct 1977, Apr 1977 to Dec 1986, Sep 1987 to Nov 1996, Jun 1997 to Dec 2002, and Nov 2002 to Nov 2012 (blue), and also showing the far more reliable linear trend for the full time period (red). What does this mean - that global temperatures have actually been falling for the past 6000 years, that potentially we were sliding back into a glaciation, that some benefit of global warming may have been achieved by the release of greenhouse gases to stop the next glaciation, but that temperature associated with massive greenhouse gas releases is now beyond that that may have fortuitously intervened on a return to glaciation to a point where greenhouse gas accumulation will now ensure a warming climate. 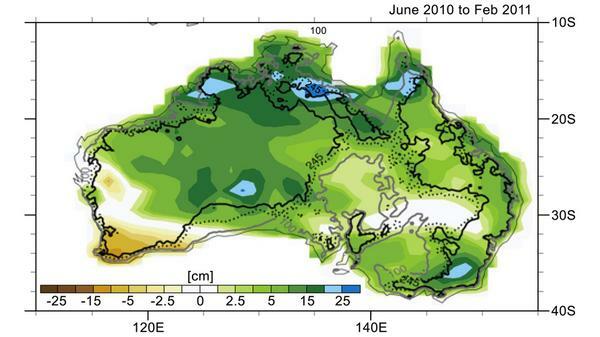 Enhanced greenhouse effect impacts in Australia and a call for immediate responses. The Australian Government must deliver the highest possible priority to responding to climate change given the latest from the Intergovernmental Panel on Climate Change (IPCC) has been reported to be the “bleakest yet”. The most recent report from the IPCC describes increased certainty of dangerous climate change and underscores the need an increased urgency for action on global warming created by human activity. Forecasts from the Intergovernmental Panel on Climate Change suggest global temperatures are likely to rise in the range of 1.8°C to 4.0°C this century. In Australia's latitudes, a warming of 1.0°C is sufficient to move climate belts in the southern half of Australia about 150 km south (smaller movements in Northern Australia).Thus, a regional change of temperature of 2 °C – the bottom end of the IPCC range – is likely to have a catastrophic impact in Australia, more so inthe southern half. A 300 km shift in climatic bands will change the distribution and abundance of a huge range of species, and impact on agriculture, forestry, tourism and a raft of other economic activities that contributes to the welfare of Australian communities. However, the impacts warming and not equally distributed over the planet - some places will warm more, some places will warm less. Australia is forecast to have an unequal share of warming, and CSIRO predicts Australia may see between 1° and 5° of warming by 2070. Warming at the extreme end of that range has the potential to move climate belts 750 km. In Western Australian terms, that brings Carnarvon's climate to Perth, and pushes Eneabba's climate south past Albany in less than 60 years. Because average temperatures are expected to rise more near the north and south poles than near the equator, the shift in climate zones will be more pronounced at higher latitudes. In the mid-latitude regions (45° to 60°), present temperature zones could shift by 150–550 km. Since each of today's latitudinal climate belts is optimal for particular crops, such shifts could strongly affect agricultural and livestock production. Efforts to shift crops poleward in response could be limited by the inability of soil types in the new climate zones to support intensive agriculture as practiced today in the main producer countries. In the map above, much of the climate belt of the northern wheatbelt in Western Australia has gone by 2040, and the Fitzgerald River National Park has a new climate. WA SW has already suffered a 20% decline in rainfall in the last 30 years - effects on runoff are potentially serious as evidenced by a 50% drop in water supply to the reservoirs supplying Perth - and a further 20% reduction predicted, and this is thought to have already started at the end of the 1990s. Water Corporation estimate lost income in water sales in dams is estimated at $1 billion in WA through water restrictions and additions to infrastructure. Climate is a key determinant of agriculture and changes in climate will impact on all agriculture - both crops and livestock. Rising temperatures will cause a shift in budburst, shorter growing seasons, earlier harvest dates, lower crop quality. Wheat growing areas in south west Western Austalia seriously impacted and the northern wheatbelt likely to disappear while production in the remainder greatly reduced, wiping out most of an industry worth more than $2 billion. Tree crops are particularly sensitive because of longer lead times to reach production. Changes to stone fruit also be impacted as fruit production requires chilling to create bud set. Dairy and beef cattle industry will face decreased pasture production, and increased temperature stress. Honey production in Western Australia - some of the highest production rates in the world are also likely to be seriously impacted. Honey industry will face impact as native ecosystems and agricultural systems change, with honey production on the decline, complicated by the invasion of new diseases that will do better in WA's changed climate. Climate is a key influence in grape selection. Shifting rainfall patterns and drier conditions are likely to change the way vineyards operate and will reduce the wine crop - Western Australia produces less than 5% of all Australian wine, but produces about 25% of the wine in the super-premium and ultra-premium categories. Shifting rainfall patterns and drier conditions will change the way vineyards operate and reduce the wine crop. Margaret River climate will be closer to that of Perth, cabernet sauvignon and chardonnay will be lost, and a swap to varieties suited to warmer climates such as shiraz - until they too are lost to temperature increases. The Swan Valley will no longer be suitable for vines. With global warming and drying of the south coast in WA, areas with temperature increases > 2° C combined with a decline in rainfall consistently below 400 mm will lead to the loss of many species of Proteaceae in WA's SW - including the iconic Banksia. In addition, the animals that rely on those species for food and shelter will die out. Sea levels have risen in Western Australia 18.5 cm in the last 100 years (as globally) with IPCC predictions that this will very probably triple (more than 48 cm) in the next hundred years. The potential for a one metre sea level rise by the end of this century is not an extreme estimate, but is well within the bounds of scientifically-based predictions, and indeed has been forecast by CSIRO. With those sorts of rises, much of the low lying areas around areas like Perth, Fremantle, Mandurah, Busselton/Margaret River, and Broome are under threat, and coastal freshwater swamps will go saline. With much of the coastline of south west Australia a coastal sandplain with many areas well below 20 m above sea level, there is potential for catastrophic impacts over the next few centuries if we get 7 metres of sea level rise. 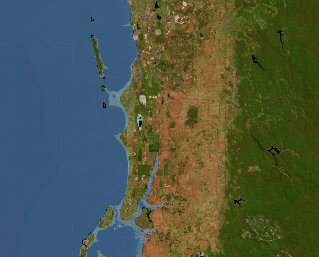 Submerged fringing reefs, currently a barrier protecting parts of Perth’s coastline will be further submerged offering less protection and allowing bigger waves to previously sheltered beaches. The Indian Ocean has warmed an average 0.6°C since 1960 - only another 0.4°C is needed for widespread and intense coral bleaching. The largest warming occurred off Northwest WA, and it is likely higher ocean temperatures will bleach coral and kill large parts of the Ningaloo Reef just as higher sea temperatures will kill large parts of the Great Barrier Reef. Shark Bay is particularly sensitive to changes in temperature, and will impact the whole of the ecosystem - for example, changes in sea grasses are likely to impact the aquatic magafauna of shark bay. The southern migration of fish and marine creatures is driven by two main factors - a gradual increase in ocean temperatures, and the effects of the Leeuwin Current which runs southwards along the entire coast of WA. Other WA impacts will be the same as those around the world - on human health, the need for businesses to get ready for climate change and adapt to avoid physical impacts on the whole life cycle of their business including supply chains and infrastructure. It's time for Australian State and Federal governments to actually do something significant about this grave threat. The Government must support initiatives that will result in real cuts in greenhouse gas emissions, and not just those that merely slow in growth of emissions. The Government must also make substantial commitments to the community to get ready for the climate change that has in part already been felt in WA, and will become more severe in the coming decades. Currently Western Australia's total emissions are (as of 2004 as reported to the AGO) 96% above 1990 levels, and without action to reduce emissions projected growth in energy demand will grow emissions to be almost 200% above 1990 levels by 2030. We will need to think differently. We will need new crops, new cropping systems; new fuels (grow your own), new technology; people willing to change and innovate/ If we were raising kangaroos instead of cattle we would have lower methane emissions and a more drought tolerant stock. The Carpenter Government's response must include a strong focus on developing a diversity of renewable energy projects that can immediately deliver sustainable energy sources in Western Australia. In the absence of viable carbon capture and storage, closing old coal-fired power stations and replacing those with more efficient coal-fired, or better yet high efficiency gas-fired cogeneration power stations, and taking greater action on energy efficiency, are immediate and cost effective actions that can be taken. But this is only one step. Without zero emissions replacing a large part of our current carbon-based energy generation, we will not create real cuts. These actions will only achieving a slow down or at best stopping growth of emissions - this would not come anywhere close to reducing our emissions back to 1990 levels, let alone a target of 60% below 1990 levels. Renewable energy is currently the only technology available today and ready to be built today that can, through its deployment, provide deep cuts in greenhouse gas emissions while still providing affordable energy generation for the Western Australian community. For this reason, the Government must establish strong renewable energy targets - complete with a mechanism for delivery. Anything less than that already proposed in the Western Australian Renewable Energy Target (WARET) bill by the Greens, and supported by the Western Australian Liberal opposition, will be a major disappointment. The Carpenter Government must take decisive action and seriously commit to the enormous challenge presented by global warming in a sustainable and cost effective manner. Six years on the 5th Assessment Report from the IPCC continues to add certainty to the evidence of the role of human activity in global warming causing climate change. US research on decline in milk production due to climate change. There have been no specific assessments for Swan Valley or Margaret River, so these figures are from me forecasting as an expert – that the exit of the Swan Valley as a wine producing region is likely within a few decades, with white wine grape varieties in Margaret River likely to be under pressure in a similar time frame. Forecasts from the Intergovernmental Panel on Climate Change suggest global temperatures are likely to rise in the range of 1.8°C to 4.0°C this century (IPCC 2007). A warming of 1.0°C is sufficient to move climate belts about 150 km south, and a regional change of temperature in that order is likely to significantly impact on the majority of species. In this context, climate change is arguably the most important key threatening process to all biota . Biota living in narrow climatic bands are likely to be seriously impacted by climate change. Pouliquen-Young and Newman (1999) used the BIOCLIM program (Busby, 1991) to generate a climatic envelope combined with soils data from the present distribution of selected species. The study of species of Dryandra found that 26 of the 92 species modeled would become extinct with a temperature rise of 0.5°C; this included all those with a present distribution <1,000 km2. Similarly, a 2ºC rise in temperature would result in the disappearance of 66% of Dryandra species, which are found only in Western Australia, and 100% of Acacia species (Pouliquen-Young and Newman 1999; Pittock, 2003). Similarly, the temperature tolerance range for 41% of Australian eucalyptus species (including many WA species) is less than 2ºC in mean annual temperature (Hughes, Westoby & Cawsey, 1996). Similar studies for fauna have suggested that all of the frog and mammal species studied would be restricted to small areas or would disappear with 0.5 °C global-average warming above present annual averages (Pittock, 2003). Another example can be found in Beaumont and Hughes (2002) who assessed potential changes in the distribution of 77 butterfly species restricted to Australia. Even under very conservative climate change projections they found 88% of species distributions decreased by 2050. Biota in narrow climatic bands are likely suffer changes in the patterns of distribution and abundance of a range of species. The impacts will be both direct, such as reduced rainfall affecting plant species establishment and persistence, and indirect, such as reduced rainfall impacting bushfire regimes or increased summer rainfall increasing the spread of dieback. It is important for monitoring and ongoing management to recognise that changes may be a consequence of unavoidable impacts resulting from climate change rather than a consequence of the management. iconic Banksia. With these changes, these species will die out, as will the animals that live on them. Beaumont L. J., & Hughes L. (2002) Potential changes in the distributions of latitudinally restricted Australian butterfly species in response to climate change. Global Change Biology, 8: 954-971. Hughes L., Westoby M. & Cawsey E. M. (1996) 'Climatic range sizes of Eucalyptus species in relation to future climate change', Global Ecology and Biogeography Letters, vol. 5, pp. 23-9. Pittock, B (ed.) (2003) Climate Change An Australian Guide to the Science and Potential Impacts (Australian Greenhouse Office) 239 pp. Pouliquen-Young, O. & Newman P., (1999): The Implications of Climate Change for Land-Based Nature Conservation Strategies. Final Report 96/1306, Australian Greenhouse Office, Environment Australia, Canberra, and Institute for Sustainability and Technology Policy, Murdoch University, Perth, Australia, 91 pp. TAXONOMIC NOTE - the Genus Dryandra has been taxonomically lumped with the Genus Banksia - that is all Dryandra species are now considered species of Banksia. See details in this article in Australian Life Scientist. Note added 13 Nov 2013. Australian study by Hobday et al. 2009 predicts more sharks with ocean warming through climate change. Hobday (2009) described the preferred water temperature for a suite of large pelagic fishes (tuna, billfish, sharks) and then predicted that by 2100 suitable habitat would move further south by an average of 4 degrees (~ 450 km) on the east coast and 3.5 degrees (~ 390 km) on the west coast. 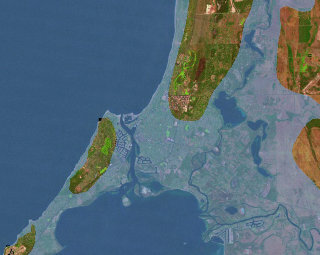 The area of suitable habitat was also predicted to decline on the east coast due to warming, while on the west coast, the area of suitable habitat would be similar due to an expansion into southern Australia (Hobday 2009). Discussion of increasing ocean temperature in Australia with climate change. Most Australian seas have increased in temperature since the 1880s, with some regions changing more than others. 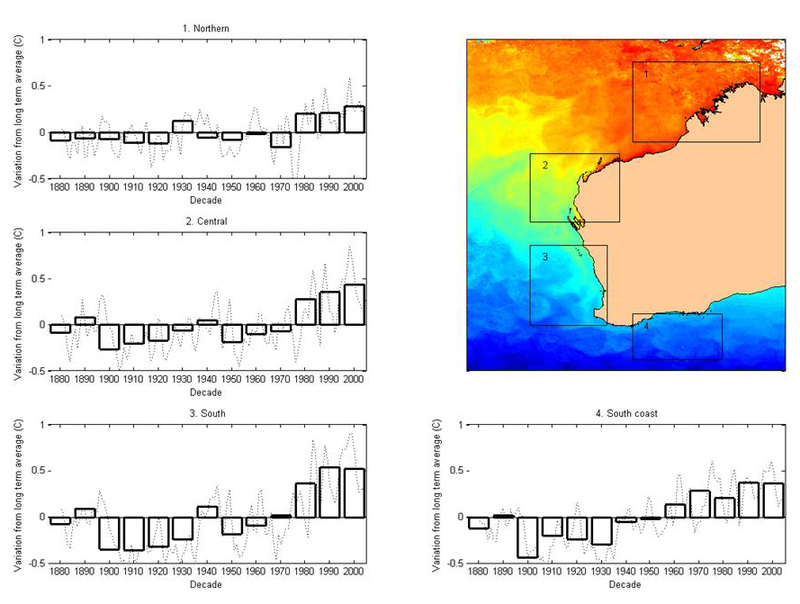 CSIRO satellite images comparing sea temperatures around Australia over time are available at http://www.redmap.org.au/article/sea-temperatures-and-climate-change/. This slide illustrates changes in Western Australia. The last time Earth was free from ice was over 34 million years ago in the Eocene epoch. Continental ice sheets first formed in Antarctica, and no terrestrial land animal survived the icing of that continent. In the past few million years ice sheets formed in the Northern Hemisphere and have pulsed across the northern continents during glacial maxima. Sourced from National Geographic If All the Ice Melted 5 November 2013. 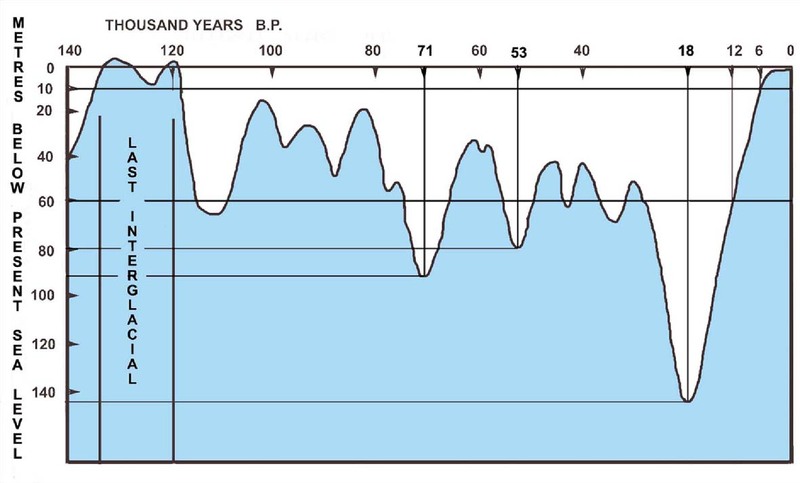 For the last 120 000 years sea level has been much lower than present. Following the last glacial maximum, the peak of the last ice age about 18,000 years ago, sea level has risen more than 120 metres, including one episode of 25 metre rise in 500 years around 14000 years ago (about 5 metres per century). 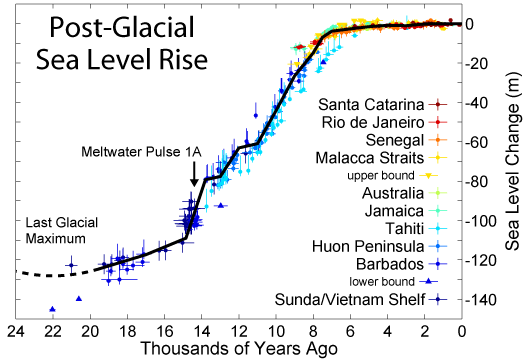 Between 6,000 and 3000 years ago, sea level rose two to four metres. Then, from 3,000 years ago to the 19th Century the long term change has been about half a metre - about 2 mm per decade. 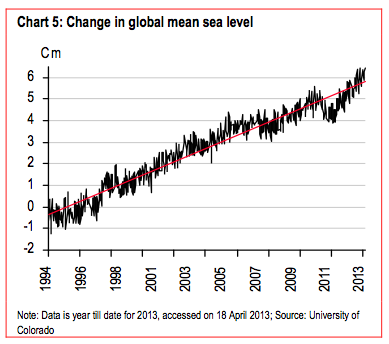 Since 1850, the sea level has risen at between one and two cm per decade. In the 20th century average sea level increase was measured at 18.5 cm – about 2 cm per decade. The natural warming cycle of the earth peaked in the past millenium, reflecting the slow down in the natural warming cycle of the interglacial periods and so the warming and melting of the world's ice reserves. Some scientists suggest that the natural warming event of the interglacial actually ended as much as 5000 years ago, and that expansion of greenhouse gas emissions associated with the rise of modern human societies - that is those that established agriculture and large towns and cities - see explanation in the Anthropocene and Stages of the Anthropocene: Assessing the Human Impact on the Earth System by G Philippon, S Vavrus, J E Kutzbach, W F Ruddiman together with this item. The potential for a one metre sea level rise by the end of this century is not an extreme estimate, but is in fact a scientifically-based prediction based on work by the CSIRO and now generally acknowledged as the most likely scenario. If sea level rises accelerates in this way, increased melting through further global warming suggest sea level rises totalling 5-7 metres in less than 500 years, and potentially in the next 200 to 300 years in the case of substantial global warming scenarios. Sea level is variable from year to year, as illustrated by the impact of extreme weather events in Australia, but unrelenting from decade to decade. More info on sea level rise. Here is a great article explaining sea level by Nicola Jones Yale Environment 360 from @YaleE360 (Yale School of Forestry & Environmental Studies). Rising Waters: How Fast and How Far Will Sea Levels Rise? Globally there are more than 140 million people living under 1 metre above sea level. In Australia, some islands in the Torres Islands are already being inundated as a consequence of sea level rise. These places are not just vulnerable in the next 90 years (to 2100) but indeed much earlier as sea level rises - large chunks of Dunsborough (and Broome), and significant chunks of Bunbury and Mandurah, are vulnerable to 30 or 40 cm of sea level rise, which we expect to occur in the next few decades. 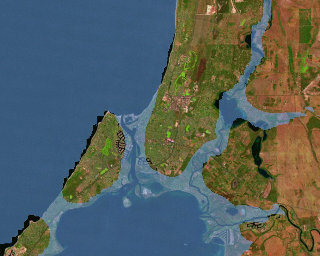 Sea level rise will impact on homes and other built up areas, but also places where roads and other infrastructure run between towns - the design of the Perth Bunbury Highway included a specification for a minimum height of the road above sea level of 0.5 metre, with the road built up with earth banks where it runs through the various places that are indeed lower than that. Sea level rise will of course also impact on some coastal nature reserves - areas that have been set aside for their biological value will be at risk. This threat is particularly significant for coastal freshwater wetlands. We will no doubt need to, and will, take measures to protect valuable infrastructure and installations such as the Kwinana Industrial Area because of the high level of investment that represents and so the economic case will be made to protect it. Higher density urban areas too may have sufficient economic worth (or political consequences) that will lead to protection measures - sea walls and dykes. Houses that are more isolated and of course any areas that are simply unprotectable will have to be abandoned, as is happening in other places in the world and in Australia already. And some local governments are taking the issue very seriously - both the City of Mandurah and the Town of Cottesloe are examples of Local Governments who have begun planning processes to consider the impact of sea level rise on their costal strips. As the consequences of sea level rise start to become more apparent over the next decade or so, we will start to see some impact on real estate prices in some of the areas with the earliest impact. Of course the source of sea level rise is a result of global warming melting ice in glaciers and the ice in the poles combined with the thermal expansion of oceans through warming of those water bodies. A sea level rise of one metre or more by the end of the century will be the result of the world failing to reduce greenhouse gas emissions and stop global warming. If we fail to reduce greenhouse gas emissions and cause the greatest amount of warming, we will face the greatest threat from sea level rise. In Western Australia not enough has been done to educate anyone about both the need to reduce greenhouse gas emissions to impact on global warming, nor the need to plan for a response to the impacts of global warming already set in train even if we do actually resond to reduce greenhouse gas emissions. If all the ice melted in ice sheets and glaciers around the world, about 67 metres of sea rise would occur. If runaway global warming occurs, a complete melt would take an estimated 5000 years. 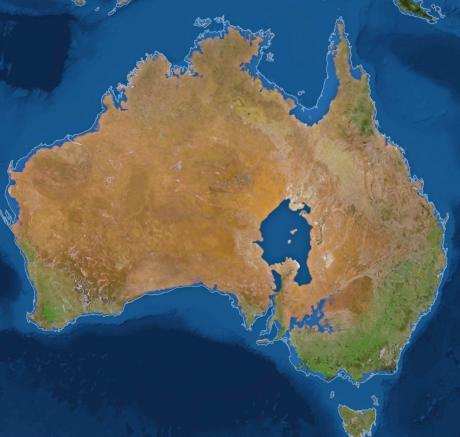 This is what 67 metres of sea level rise looks like for Australia. Image sourced from National Geographic If All the Ice Melted 5 November 2013. These images were generated about 7 years ago using a simple technique that shows what locations are above and below a certain elevation. 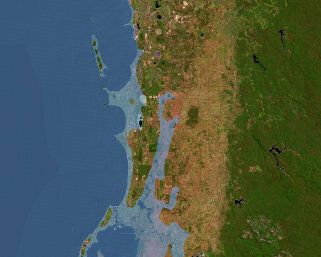 While this approach can offer a guide to the places that might be impacted by a certain sea level rise, projecting sea level change is difficult regionally and locally because there will be regional differences that are in part determined by local ocean temperature and currents, and impacted by regional and local wind patterns. As such these images were created to inform and alert Western Australian's to the consequences of sea level rise that will inevitably occur if we fail to act to limit global warming. In the last Century years, sea levels have risen by 18.5 cm with recent scientific assessments showing sea level rise is accelerating. 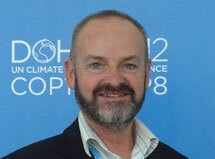 Sea level rise of up to one metre by the end of this century is well within the bounds of scientifically-based predictions, and indeed this is what has been forecast by Prof Will Steffan from the Australian National University and Dr John Church of the CSIRO. With those sorts of rises, much of the low lying areas around areas like Perth, Fremantle, Mandurah, Busselton/Margaret River and Broome are under threat, before the end of this century within the lifetime of a child born today. Research to better understand the regional impacts of climate change on Western Australia is a critical step. Research will give us a better understanding of the areas at greatest risk so we can start informing the community and preparing the State for the effects of global warming. A key area of research must include understanding the physical changes that will occur along our coast. Graphics produced by David Gifford using data provided by Geoscience Australia for the Western Australian Sustainable Energy Association Inc (WA SEA). While oil and gas reserves formed mostly over the last 300 million years, most of the best oil reserves formed in different episodes in 90-100 million years ago. 70% of oil deposits were formed in the Mesozoic age, 20% were formed in the Cenozoic age, and 10% were formed in the Paleozoic age. The Mesozoic climate was primarily tropical worldwide, plankton were very abundant in the ocean, the ocean bottoms stagnant and anoxic (preventing the occurrence of decomposition), and organic-rich muds accumulated and formed later source rocks. Much of the world's oil formed in the Tethys Sea, a broad shallow marine waterbody where tropical reefs were abundant, but the bottom was an extremely anoxic environment. 75% of the world's oil reserves formed there - today known as the Middle East's Persian Gulf. If all these periods of oil formation are agglomerated as a unit, represents as consolidated reserves about 40-50 million years of carbon capture and storage of atmospheric carbon. In the last 70 years or so we have burnt half of the world's oil and petroleum reserves and in another 40 years, more or less based on current rates of consumption, we will burn most of the remainder. 50 million years of natural modification of atmospheric CO2 through biological carbon capture to oil which humans will then have reversed by burning as fuel and re-injecting all that stored CO2 into the atmosphere in around just one century. You can draw the same analysis with coal although coal reserves are older and the geological history is longer - the most energy rich coal resources, the black coals, are mostly formed about 360-290 million years old during the Carboniferous period (which means "coal-bearing") and while there are many examples of deposits that are younger and a few that are older, the best coal resources are about that vintage. Lesser amounts continued to form in some parts of the earth during all subsequent periods, in particular the Permian period (290-250 million years ago), and throughout the Mesozoic era, 250-65 million years ago, but thiese are less energy rich, mostly brown coal or lignite. Some coal formed in the Paleocene (65-55 million years), found in Columbia and Venezuela and Miocene coal (20 million years), found in Indonesia. If you add up all the coal forming periods you get about 50-60 million years of carbon capture and storage into coal, with very roughly about 1/4 burnt to date in about 100 years of serious burning with about 3/4 in the next 200 years of burning to go if we don't slow down. So another of 50-60 million years of CO2 carbon capture in coal largely reversed in around 300 years or so of coal burning. In terms of regional variations - these are outlined by the IPCC in detail in 2001, the updates released in the most recent analysis from IPCC in 2013. In terms of pollution, particulates act in global dimming, so the pollution over India for example slows the impact of warming (but also interferes with the monsoon, as it does in Indonesia). One impact as we actully clean up air pollution is that it frees up the expression of warming in thos places (as it did in Europe and North America in the 1980s as we acted to reduce acid rain caused from SO2 from motor vehicles which led to increased warming in those areas). Lots of this information is now really well documented via wikipedia (http://en.wikipedia.org/wiki/Main_Page), including the main page http://en.wikipedia.org/wiki/Global_warminghttp://en.wikipedia.org/wiki/Global_warming. A numeric counter system at http://www.worldometers.info/ but this just uses a simple algorithm on annual stats to consider accumulated change over the year based on the date on your computer. The University of Alaska at Anchorage has produced a report, "Estimating Future Costs for Alaska Public Infrastructure At Risk from Climate Change." The full report is at http://www.iser.uaa.alaska.edu/Publications/JuneICICLE.pdf. An executive summary is at http://www.iser.uaa.alaska.edu/Publications/Juneclimatefinal.pdf. We need to work on Estimating Future Costs for Western Australia from Climate Change. Check out this 2012 interview on "Global Warming: What We Knew in '82" with Mike MacCracken from the University of Michigan - interviewed by Peter Sinclair.